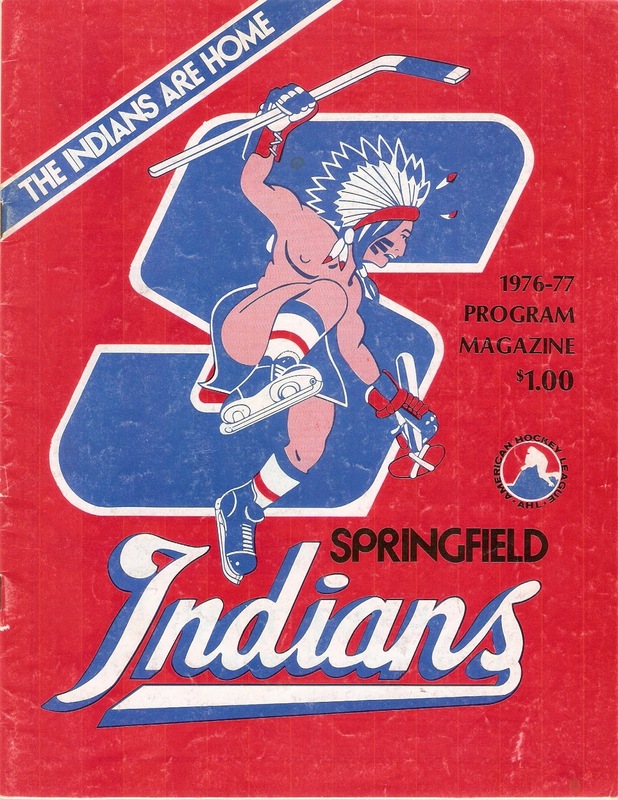 The Springfield Indians franchise is one of the oldest minor-pro hockey franchises in North America. The Indians were born in 1926 in the Canadian-American Hockey League, lasting for seven seasons before folding. In 1935, the franchise was revived in the American Hockey League when the Quebec Beavers relocated to Springfield. In 1939, Boston Bruins legendary defenseman Eddie Shore purchased the Indians franchise. He ran the franchise for the next 28 years (with a short hiatus during World War 2) before selling the team to the new Los Angeles Kings, who renamed the Indians after the parent club. Shore returned during the 1974-75 season, restoring the Indians name and jerseys, and leading the team to it's fifth Calder Cup before selling the Indians the following year. By 1976-77, the Indians were struggling. The team slumped to a 28-51-1 record, fifth place in the six-team AHL. The Indians abysmal 57 points were just three points better than last-place Rhode Island. John Hanna started the season as head coach, but was canned after a 12-24-0 start in favor of Gary Dineen. Dineen didn't fare much better, going 16-27-1. Attendance was second-worst in the league as well, as only 2,924 fans per game bothered to show up to Eastern States Coliseum. The Indians were affiliated with the NHL's Philadelphia Flyers and Washington Capitals. Springfield had the fourth most goals scored in 1976-77, lighting the red light 302 times that year. They were led on offense by Andre Peloffy, who pumped in 42 goals and 99 points. There was a bit of a dropoff after Peloffy, as only two other players scored over 20 goals. Peter Laframboise was second in points with just 68. The Indians were dead-last on defense, surrendering 390 goals, 41 more than Rhode Island. They used five different goaltenders that year. Grant Cole played in 49 games that year, going a respectable 18-24-0 record with a 4.53 GAA. Jerome Mrazek played 33 games, but went 7-22-1 with a 5.38 GAA. Former Flint General Rick St. Croix made it into one game that year (the one this program is from, I believe), later making it to the NHL. Reggie Lemelin also spent time in Springfield before carving out a long NHL career. John Kiely was the other netminder that year. With such a miserable record, the Indians failed to qualify for the Calder Cup Playoffs that year. They finished 21 points behind the last playoff team, Hershey. The Nova Scotia Voyageurs went on to win the Calder Cup in six games over Rochester. Aftermath: The Indians would continue to struggle on the ice, missing the playoffs 8 times in the next 14 seasons. In 1989-90, the Indians would barely make it into the Calder Cup playoffs with a 38-38-4 record, but surprised everyone by winning their sixth Calder Cup. After repeating in 1990-91, the Indians would see attendance decline in their last three seasons in Springfield. The franchise would relocate to Worcester, Massachusetts, for the 1994-95 season, renamed "Worcester Ice Cats". The Ice Cats stayed in Worcester for 10 years before moving to Peoria, Illinois, becoming the new Peoria Rivermen. The AHL Rivermen would then move to Utica, New York in 2013, becoming the Utica Comets. Springfield would be granted an expansion franchise after the Indians left, the Springfield Falcons. The Falcons still fly in Springfield to this day.